Members at Lumine Mediterránea Beach & Golf Community, the home of European Tour Qualifying School Final Stage, will now benefit from access to playing opportunities at some of the most prestigious golf courses on the planet, following a new partnership with Pacific Links International (PLI), the world’s most comprehensive golf network. The partnership will also provide exclusive incentives for PLI’s Network Golfers, of which there are more than 120,000 worldwide, to experience one of Europe’s most popular golf and leisure destinations. Reciprocal access for Lumine members will extend to golfing facilities across PLI’s growing portfolio, consisting of 390 clubs in 36 countries, including the likes of Abu Dhabi Golf Club, Vietnam’s Laguna Lang Co and 2018 Ryder Cup venue, Le Golf National. Located just an hour south of Barcelona, Lumine offers an unrivalled golf experience for all standards of player, including two courses designed by World Golf Hall of Famer, Greg Norman, Lumine Lakes and Lumine Ruins. The resort’s acclaimed trio of courses is completed by Lumine Hills, a championship layout set among leafy woods and olive plantations and boasting incredible coastline views. Aside its fabulous golf offering, Lumine serves up a plethora of things to do and see off the course, be it indulging in the first-class hospitality and cuisine on-site, exploring the ancient city of Tarragona and its World Heritage sites or soaking up the sunshine at one of the pristine beaches situated close to the resort. 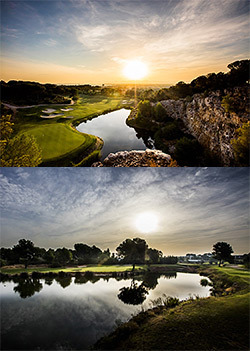 "Lumine is one of the most highly-regarded golf courses in Spain and we are delighted to have the opportunity to welcome them as a new Network Club,’’ said Rudy Anderson, President and Chief Executive Officer of Pacific Links International. "We are proud to boast many of the world’s top clubs among our growing Network and with its standing as one of Europe’s best golf courses, there’s no doubt that Lumine Mediterránea Beach & Golf Community will prove to be a popular option with our International Members." Pacific Links International has created the world’s most comprehensive reciprocal golf course network and serves as the golf industry’s leading portal to the avid, travelling Chinese golfer. Pacific Links provides its Asia-based International Members with a premium golf experience through an innovative international membership structure. Pacific Links offers them access to the finest collection of high-quality golf clubs in the world. Since 2012, the Pacific Links network of Affiliated and Reciprocal clubs has grown to over 340 properties located in 33 countries around the world. The Pacific Links golf network serves this membership base in Asia, as well as an aggregated population of over 120,000 network golfers from participating network clubs. The main feature of a Pacific Links partnership for participating Network Clubs is the opportunity to offer reciprocal or affiliate access to other destinations across the Pacific Links International Network to their own members.